homebody : a person who likes to stay at home, especially one who is perceived as unadventurous. It’s kind of hard for people who knew me a some 10-12 years ago to believe this to be true of me. I’ve had loads of friends offline and have been actively involved with people always. Perhaps, one early hint of my ‘homebodiness’ is the fact that I never really liked to go out for parties. When I moved to Mumbai, post-marriage, it seemed to provide the right atmosphere for my inner homebody to show itself. I didn’t need to go out to work and found that I loved the idea. I know it’s crazy that we lived in Bandra, one of the supposedly “happening” places for a good late night out. But not for me. Thankfully, José is pretty much of an introvert, but even he finds me a little hard to understand at times. Yes, I actually prefer my own company. Don’t get me wrong I’m not anti-social, just that being an introvert, home is where I can really find solitude. I love reading and home is the place that guarantees me the peace and quiet to read loads. I’m so happy that blogging (and the fact that I’m supported by my husband) affords me the luxury of working from home. I’m aware that I sometimes overdo the stay at home bit, I’m trying to balance going out while being a proud homebody. 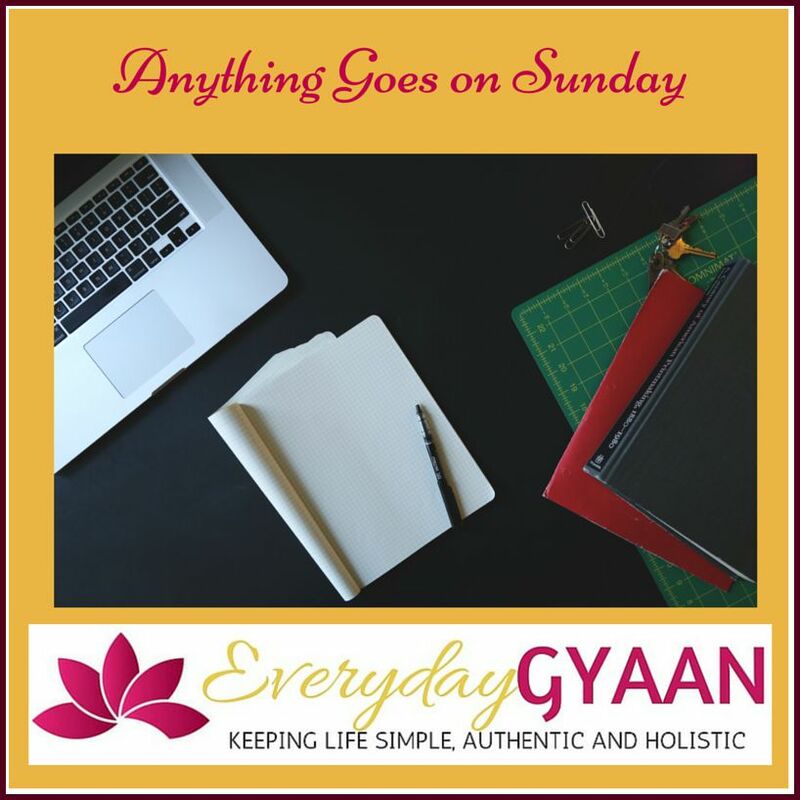 As part of my August celebration, I’m reviving #AnythingGoesOnSunday – an invitation for you to add yours link for your Sunday posts to the linky below. No theme, no prompt – anything goes! However, I’d appreciate if you left a comment and visited at least two of the blogs linked before yours! I would believe you, Naba! Once I stopped working full time, homebodiness took over! Me, me ! Mega homebody and love it. I’m similar. For as long as i can remember, my close friends have been “dragging” me somewhere, and I let them, because I know left to my own devices, I’d be too content to just stay home. There is so much I can do there to entertain myself without having to leave! Even when i lived in the city, my friends and neighbours in Johannesburg called me a hermit, because weeks would go by without my leaving my going out even though I was in the middle of a city and two blocks from a large mall. My younger sister made me promise to not buy groceries through online facilities because she says if I get into that habit, I will no longer have a reason to leave home, as I also work from home. But things are different in Phokeng. Family, friends and community members drop by on a regular basis, so even though I’m not out and about, I’m connected to the community. It’s good when I enjoy company; rough when I’d rather have some quiet. Have I met anyone like you, Corinne? Oh, yes, and it’s me!!! I am a devoted homebody, too. Love and blessings, my friend! Ah really? I’m starting to wonder how I’ve attracted so many like-minded souls into my life! 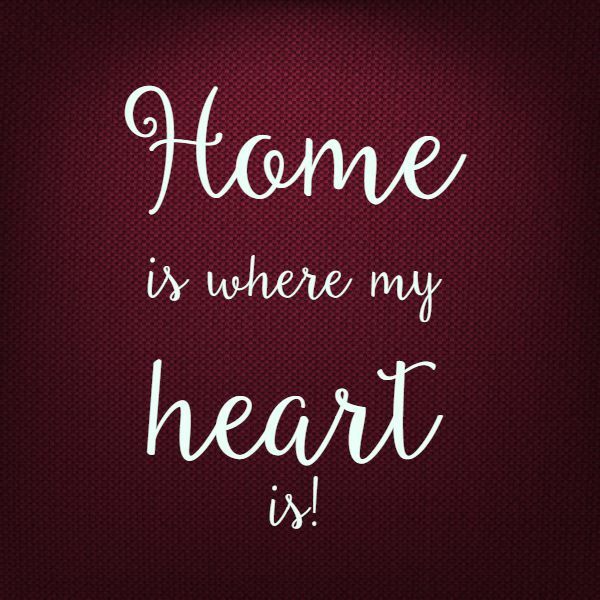 So I now know I am a homebody too! I am expressive, I talk a lot with people I know but I am someone who draws energy from within. So I am an introvert. But at the same time, I love knowing new people and learning from others. I also get uncomfortable with a lot of people around. Like you, I prefer smaller groups where I have more opportunity to listen to some real conversations. You post made me think about myself Corinne. Thank you for making me reflect within! I’m not surprised, Parul. From our brief interactions online, I’ve found you to be introspective. Corinne, I wasn’t always a homebody but have been that way for the last two decades. i am happier in my own space. People find that hard to understand though. And oh, like you I prefer to socialize with just a couple of people and not in large groups:) I have always been that way right through my life. I find it more meaningful. Me too, Lata. I had loads of friends offline and the nature of my activities included large groups. Now I find so much meaning in one to one conversations and small groups. while I’m not a party animal, I do enjoy the company of others but there are times when I like to stay at home and just potter around revelling in the feeling of having the house to myself. You sound like a well-balanced person, Sunita. Having met you in person, I realize how easily you warm up to people! I am about as introverted as they come. So, it doesn’t amaze me that someone would want to stay home instead of going to a large gathering. Even if I am with people I know (let’s not talk about going to a large event alone) I find being around many people as draining. I am not sure that I would call myself a homebody-but I do want to be able to have total control over my socializing. Draining is exactly the word, Alana. If I have to go to large gatherings, I take at least a day to recover! I like to choose. I spend much more time than I would like to here in Belgium, but I would not feel comfortable to go out ‘just-because’. I cannot wait to get over this never ending tiredness to get back to some “life”. I didn’t realize you were presently in Belgium, Debbie. I hope you get back to ‘life’ really soon!